Upon entering the golden doors of Mott 32, I immediately felt like I was transported to an antiquated Chinese era. 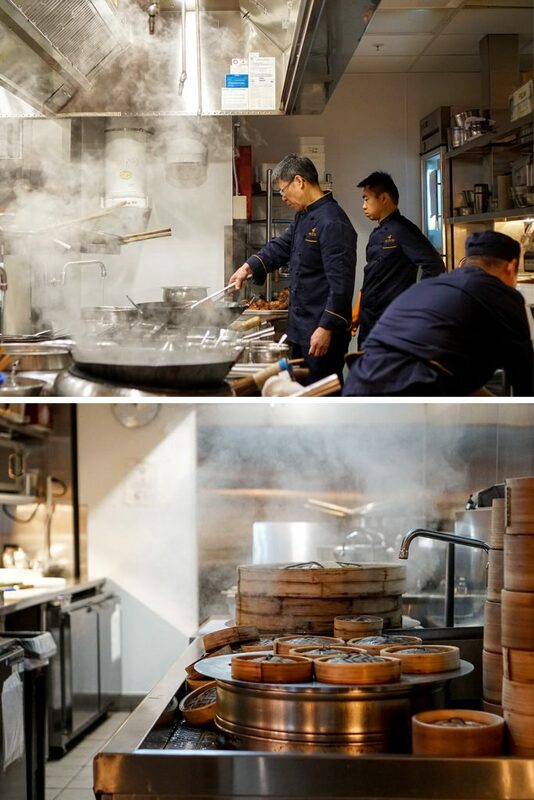 Being named after NYC’s first Chinese convenience store which opened in 1851 on 32 Mott Street, Mott 32 completely resembles the vibrant, bustling Chinatown in one of the most animated cities in the world. 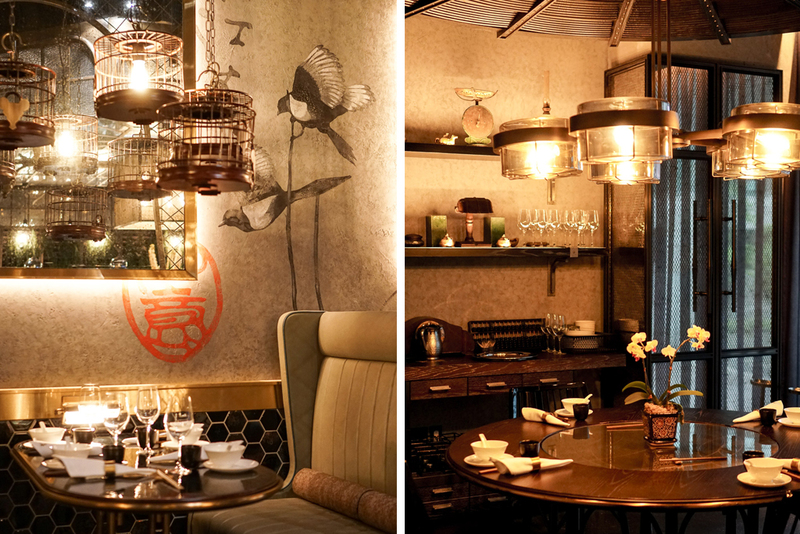 Surrounded by a hybrid of contemporary and old Hong Kong opulence, designer Joyce Wang helps take you away to an exotic escape with abacus details, bird cage fixtures, and even a private opium den inspired room. 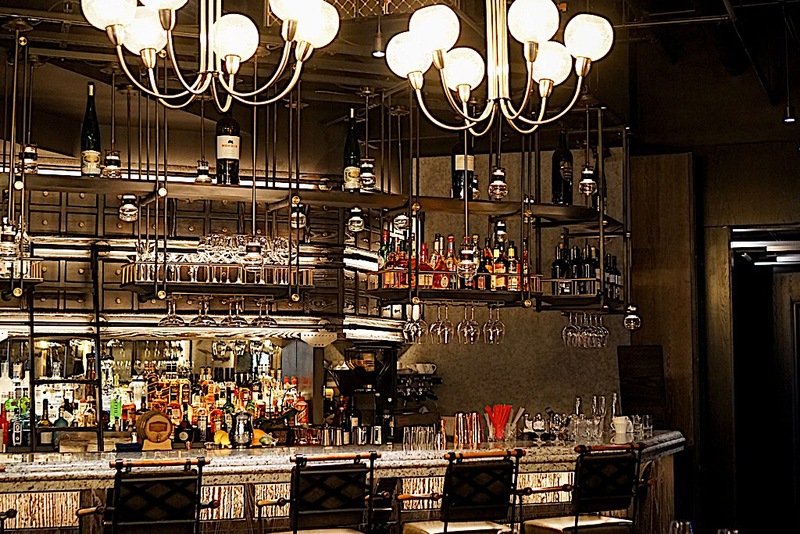 Natural elements of wood, marble, glass and leather complement the dark, edgy vibe of the restaurant. The main dining room is in the central octagon, where you are the center of attention with an open view into the kitchen and a small bar tucked in an inconspicuous corner. 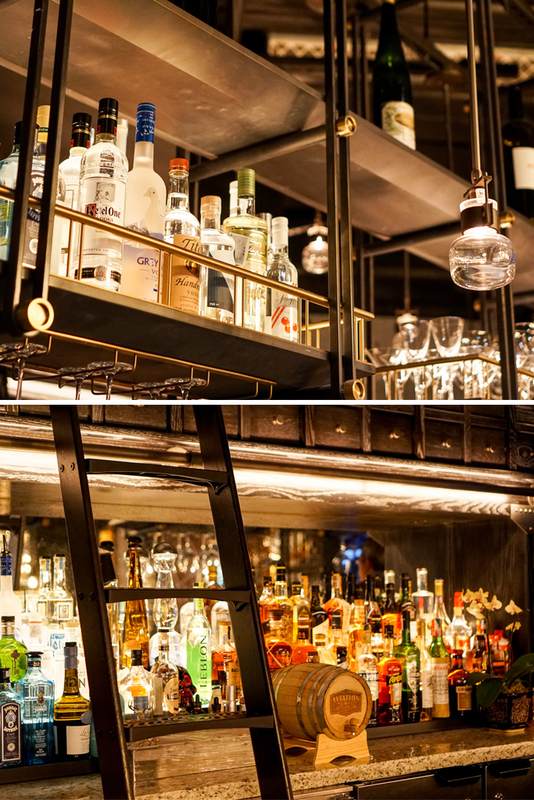 The cozy bar is intimate but serves up a craft cocktail list with obvious Asian influences – osmanthus honey, infusions with ginseng roots, goji berries, pomelo, air-dried tangerine peel, shiso leaves, star anise and cardamom. My personal favorite is the Hanami (Buffalo Trace whisky, Tanqueray gin, umeshu, yuzu, shiso, ginger beer, and chrysanthemum). Not only is it pretty, it is also sweet to my satisfaction. 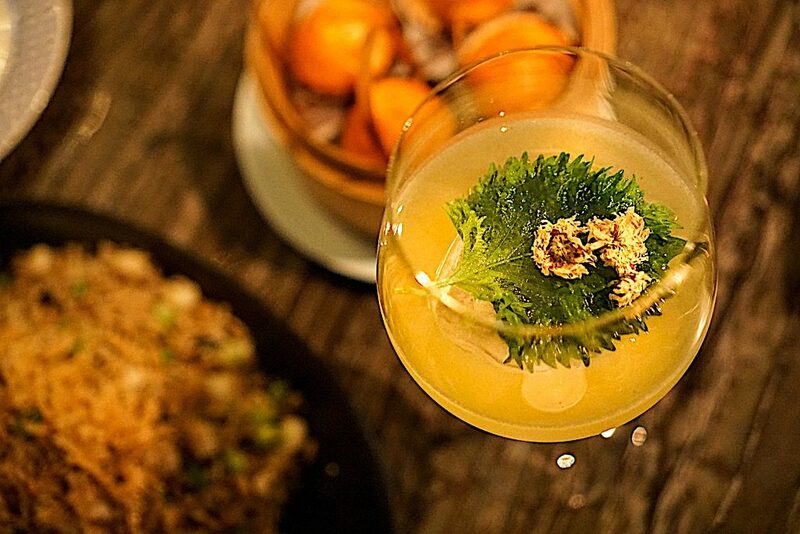 For those of you who scoff at sweet cocktails, there are plenty of other offerings including Mott St. Cooler, Old Harbour (Fashioned), Oolong Tea, and Hong Kong Iced Tea. 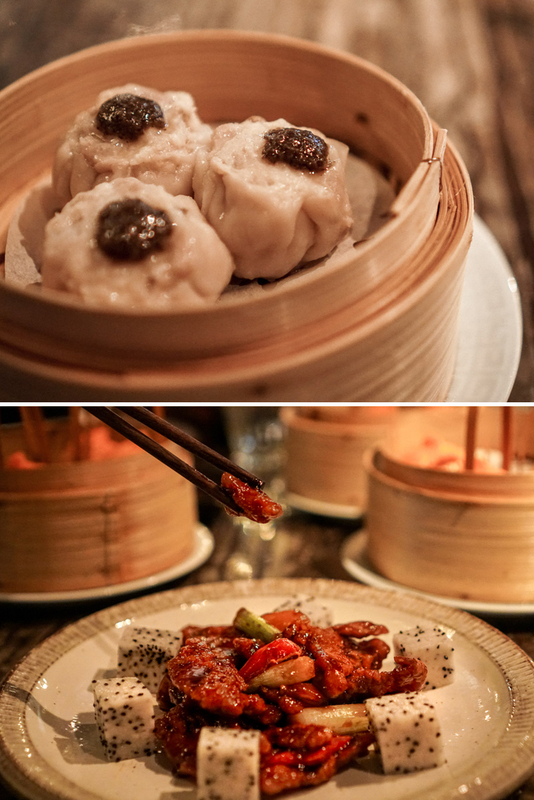 Mott 32 focuses on traditional Cantonese cuisine as well as Szechuan and Beijing-style dishes. 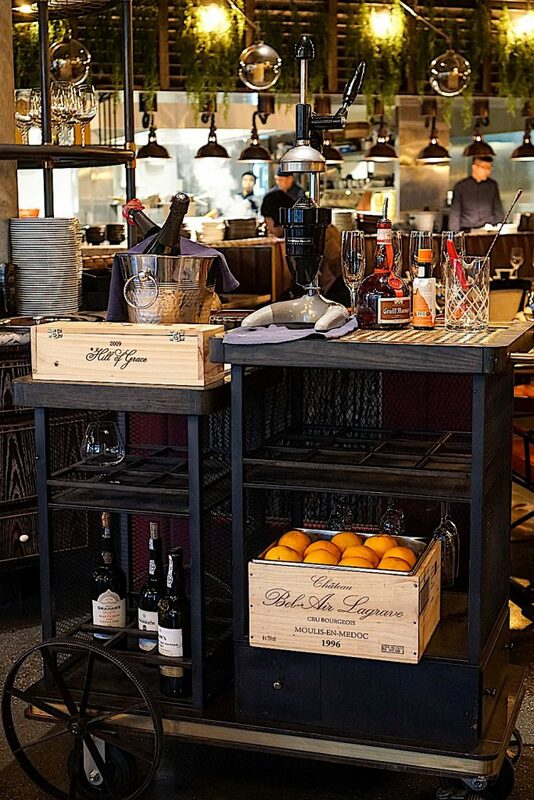 While traditional, the chefs also embrace bringing together unique, local flavors to elevate the conventional recipes of Hong Kong into utter luxury. There are many outstanding dishes, but my favorite is the Mixed Seafood Fried Rice. 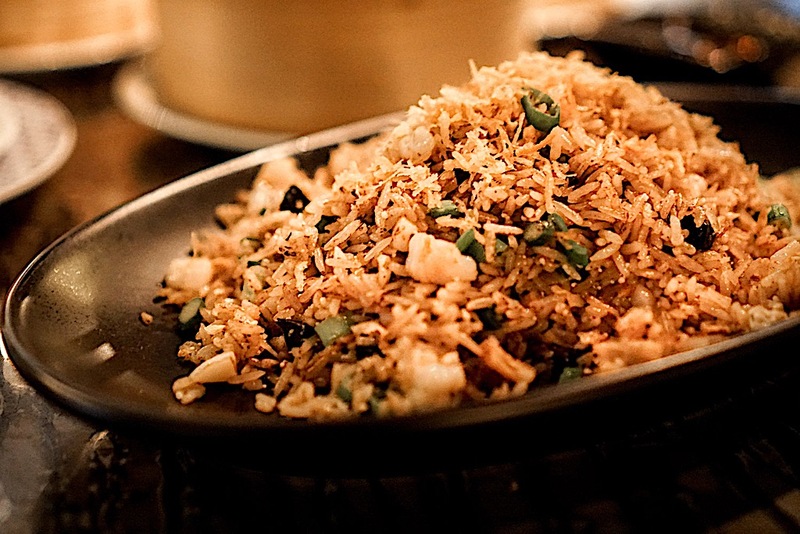 Fried rice is such a staple in all Chinese cuisine, but there is just something about this fried rice that is comforting and palatable that I find myself reaching for seconds then thirds. A close second is the infamous Xiao Long Bao (hot & sour soup) Dumplings. Served in quantities of four in tall-handled baskets, the bright orange, unusually spicy wrappers are filled with hot soup spiked with spicy chilli paste. The Siu Mai is equally impressive topped with black truffle. A small quail egg inside the siu mai bursts with runny yolk at first bite which takes this dim sum dish to a whole other level. 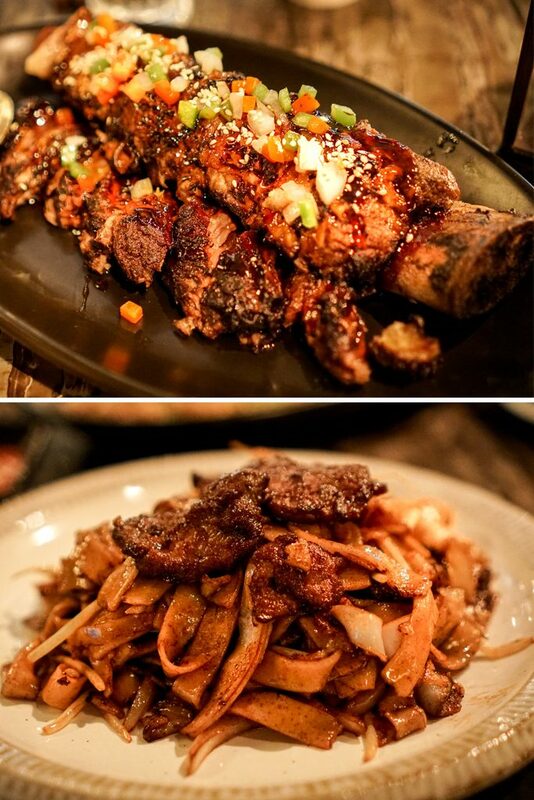 Other notable dishes are the Black Angus Short Ribs, Sweet & Sour Pork, and the Wok Fried Flat Rice Noodle with Beef. Overall the dishes are in fact traditional, but given more attention, flavor, and luxury than the original recipe. 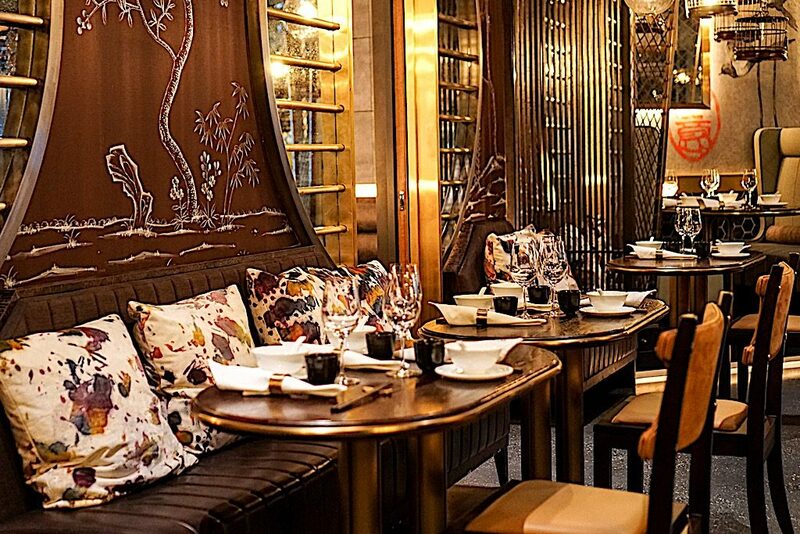 If you want to escape to olden day Hong Kong and experience authentic Cantonese cuisine in sheer opulence, look no further than Mott 32 to transport you there. Adjacent to Mott 32 through the golden doors, you will see The Trump Champagne Lounge (“TTCL”). The bright, airy, modern space of TTCL is the perfect setting to catch up with friends, have business meetings, enjoy a girls’ day, or spend a romantic date while lounging on plush booths listening to live music serenading you in the background. 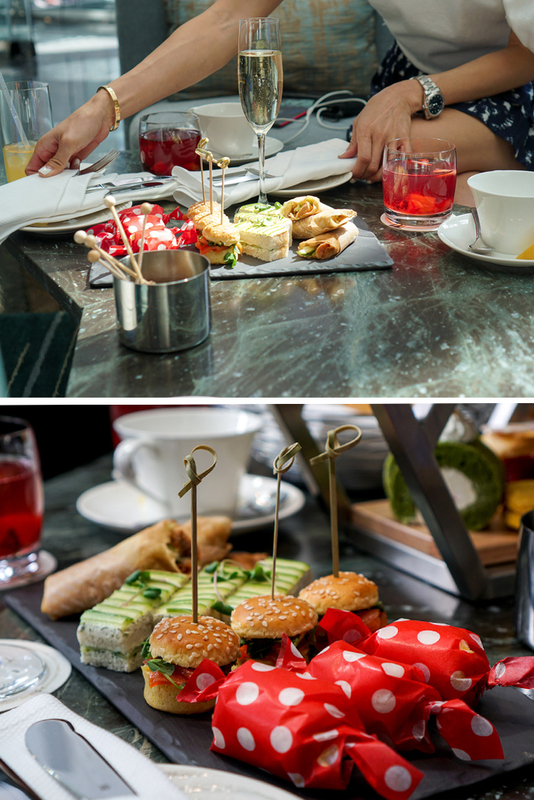 On most hours TTCL serves ornate cocktails and rare and unique wines, and sophisticated champagne, but everyday between 12PM to 4PM, the lounge becomes the setting for a chic and modern Afternoon Tea time. 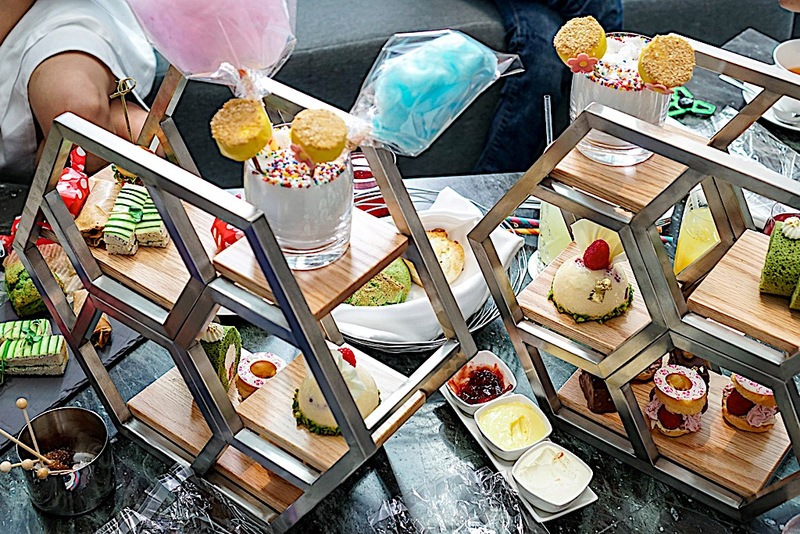 While almost everyone has had some version of Afternoon Tea before, you have not had Afternoon Tea like you would here at The Trump Champagne Lounge. Serving the classics such as scones and finger sandwiches, TTCL adds its own playful twist on tea time with its impressive, custom designed, hexagon display of delightful tea time favorites. As steam rises from your perfectly steeped cup of Geisha Blossom tea (or any other 21 tea options), you can nibble on both savory and sweet treats with global influences such as spicy duck crepes (my absolute favorite), ‘Salmon a la Bombay’ sliders, Rolled Egg Sandwich with Italian truffle tapenade, and matcha green tea scones. And for your sweet tooth, you will be pleased to know that all of the pastries are made in-house by Executive Pastry Chef Fumiko Moreton. 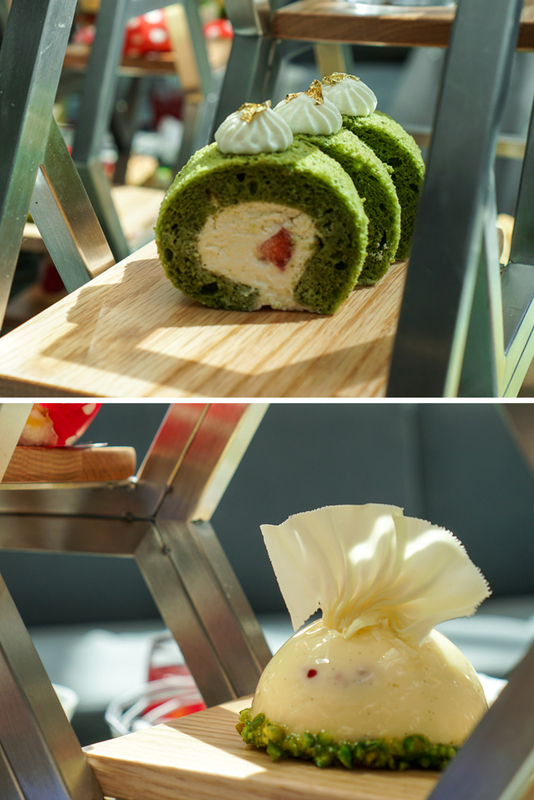 The exquisite presentation of desserts such as Matcha & Strawberry Rolled Cake to the Raspberry Rose Water & Lychee Paris Brest melt in your mouth and leave you wanting more. And there is more! 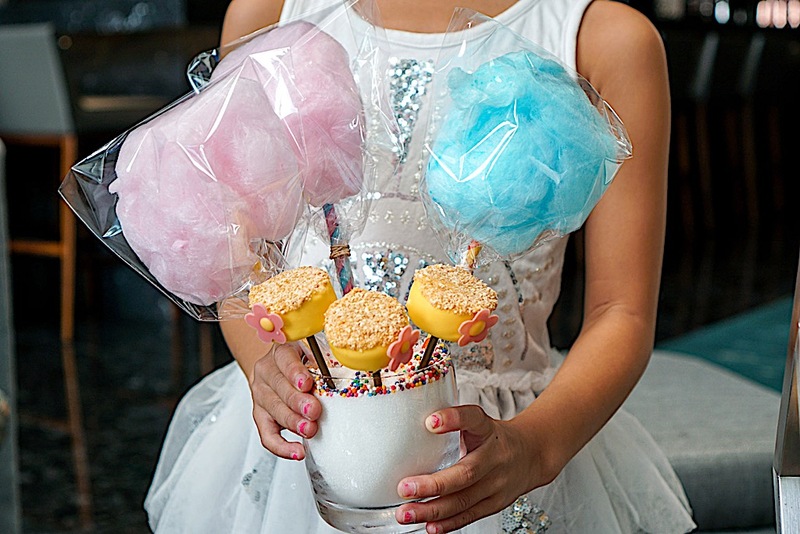 From the carnival-like display of cake pops and cotton candy that top the hexagon tower to traditional favorites like macarons, these yummy goodies will not disappoint! 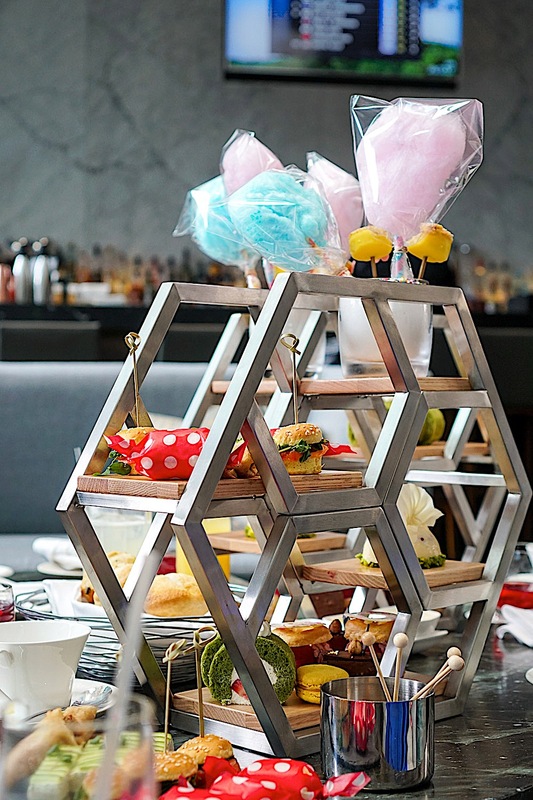 Afternoon Tea at The Trump Champagne Lounge is a must do experience for all (yes, including kids too). 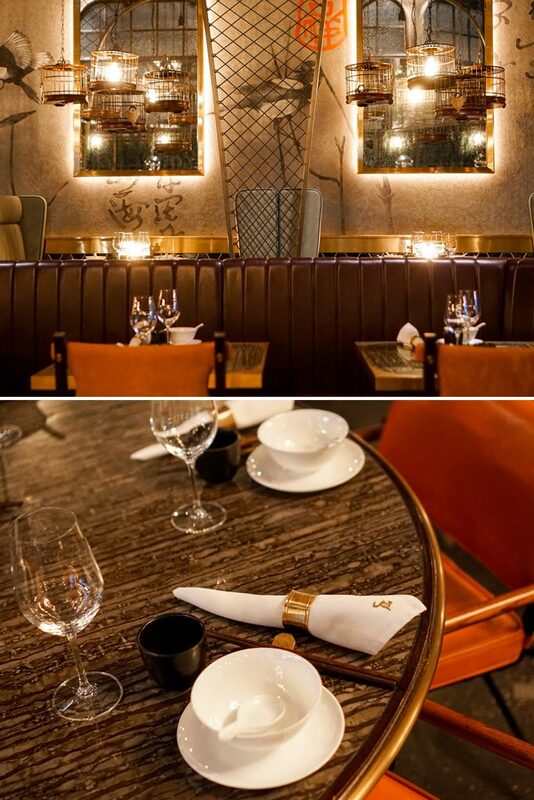 The lively, atmospheric, modern tea room boasts a cozy, refined ambiance and is the ideal place to really experience a modern, chic tea affair. 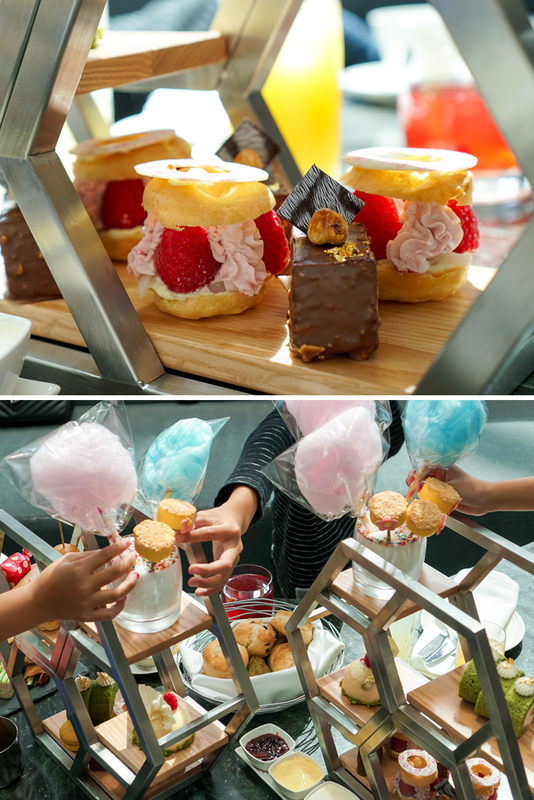 Thank you to The Trump Hotel & Tower Vancouver for sponsoring these incredible dining experiences. I would be such a fan of this hotel because my family is from Hong Kong so I can appreciate the culture and food. I a also a huge fan of matcha and tea so it seems like you had an incredible dining experience. I feel like I don’t put much effort into choosing my hotel rather than just the experiences and attractions of a city but I definitely will after reading about your amazing stays! They have a Mott32 in Hong Kong which is where the chef came from. The food is quite authentic and I love the decor of the restaurant. 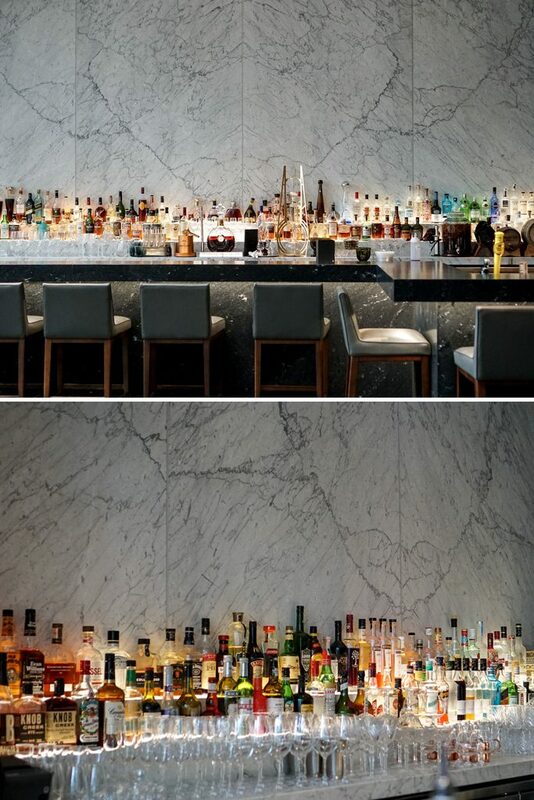 They have these two amazing restaurants at The Trump Vancouver and is definitely a place to check out and dine if you are in the area. What a beautiful place! Looks extremely elegant and I love all the details they put into their decorations and interiors! Hi Tina! It truly is a lovely place. The designer for Mott32 really put so much thought into every single piece and decor. 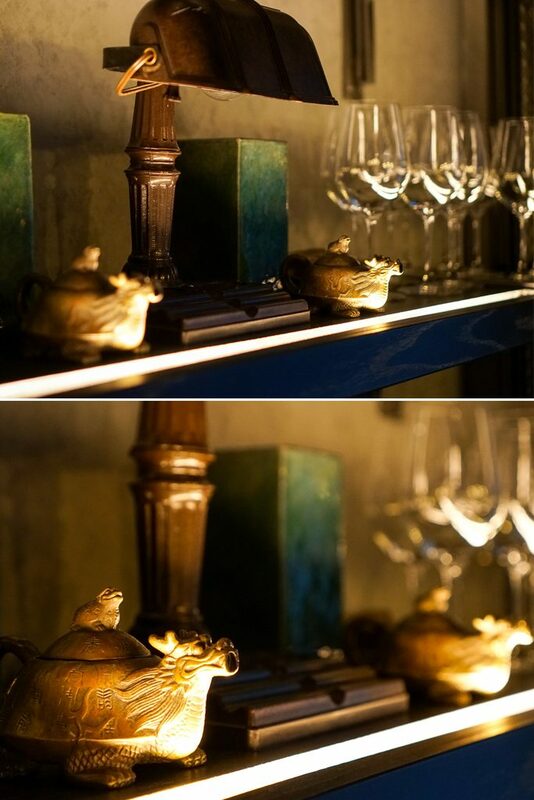 The food is as luxurious as the decor too! This is the kind of place you will take a lot of friends and have a great fancy time. It’s so beautiful. Yes, either restaurants can be fun places to hang out Deddeh. 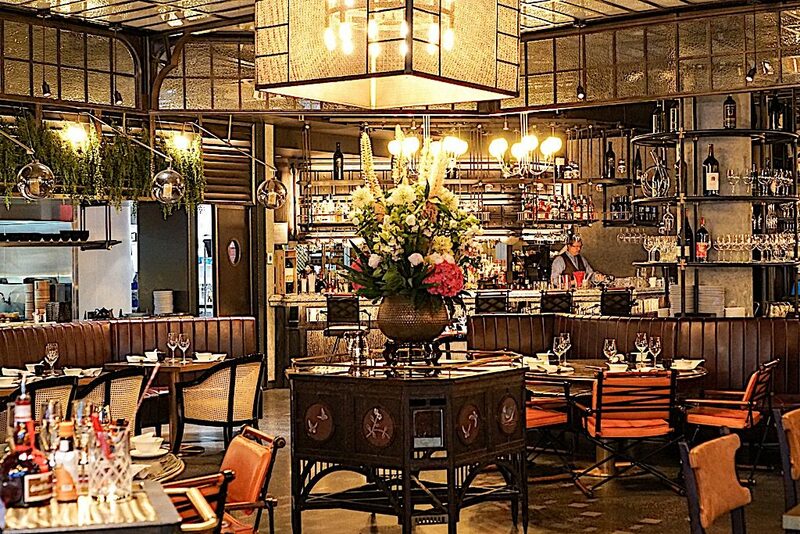 Mott32 is great for a nice dinner and long meals. The Trump Champagne Lounge is perfect for girlie get togethers and just a fun time over tea and light bites. What a gorgeous restaurant!!! It really looks like you are in Asia, wow! The food and tea service both looked incredible. I’ve heard such great things about Vancouver. Mott32 really does transport you to Hong Kong! Vancouver is such an amazing city. You definitely have to go for the city life, nature, and best of all – food! Omg what a gorgeous place! The afternoon tea looks sooo good! Thanks Keri! Both restaurants are so beautiful yet so different. The tea was so much fun and I love their modern twist on Afternoon Tea. Looks like an amazing spread Christine! I’ve yet to visit Vancouver but hope to plan a trip this Fall. Thank you for posting, looks like an amazing stay! Thank you Milica. I will definitely stop by your blog. It truly is beautiful Delaney! A must visit place for fine Chinese dining and modern Afternoon Tea. The food was amazing at both places. They are so different and it is nice that they are right across from each other. Vancouver is such an incredible city and I highly recommend you visit there if you can. I’m so glad there’s a Mott 32 in Vancouver now! I just visited the one in Hong Kong and loved their dim sum. Hi Carolyn! Lucky you that you got to go to Mott 32 in Hong Kong! That’s the original and the chef for Mott 32 in Vancouver is from Hong Kong too. Their food is just outstanding, isn’t it? Mott 32 looks so fancy, with that grand yet antiquated feeling 🙂 I love the interior so much, and the food looks delicious! Definitely going to have to visit if any family members come over! It totally has the old, modern feel Elizabeth. The interior is breathtaking and every single piece and decor item was so well thought out. It is a beautiful setting and the food is incredible too. Beautiful place.It’s so lovely.Makes me feel like I should just travel more because there’s so much for me to see out there. You definitely should travel more if you can because there is so much to see and eat. =) Vancouver is a fantastic city and there are many fine dining options including Mott 32 and The Trump Champagne Lounge! Thanks Natalie, I hope you are doing well! I didn’t know there is another Mott 32 in NYC!!! I love Mott 32 in Hong Kong. 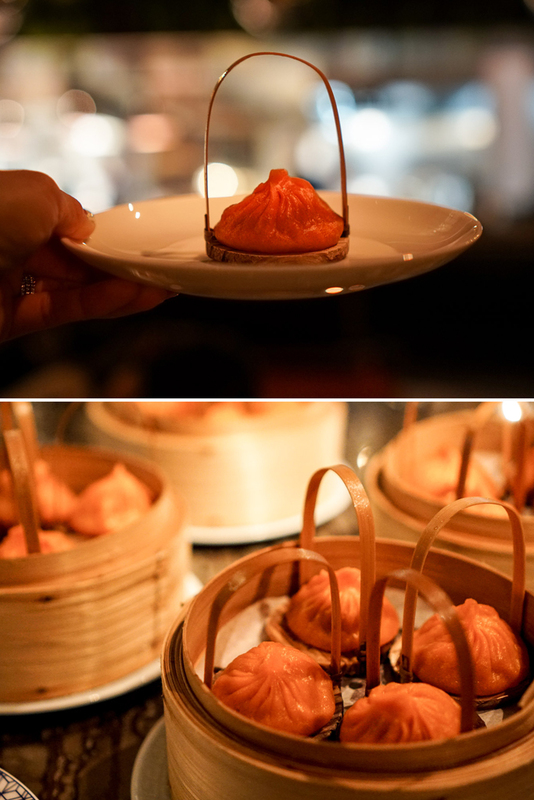 When I have visitors coming from overseas, that’s actually my go-to restaurants because of the amazing peking duck they serve and all the dishes have a touch of fusion twist. The interior of the Mott 32 looks almost exactly the same as the one in Hong Kong. You have to check out the one in HK one day Christine. Yes the original is in HK and they just opened this one in Vancouver not too long ago. The interior is so luxe and amazing, it took my breath away. We didn’t try the Peking duck even though it’s their signature dish because we made last minute reservations and you have to give them notice to prepare. But heard such incredible things about the duck here! One day I would love to go visit the one in HK! Such a stunning hotel!!! Glad you had a great time!! Hi Nina, thank you. 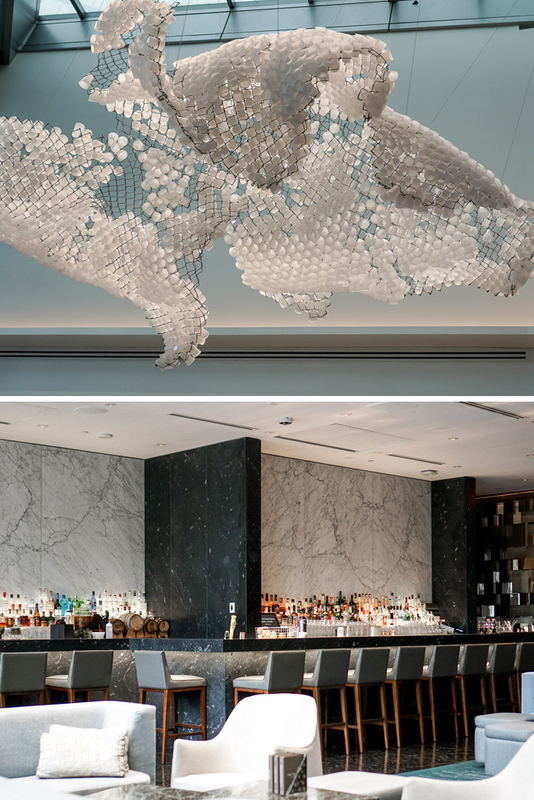 The Trump Vancouver is truly a fab hotel and the dining options such as Mott 32 and The Trump Champagne Lounge are not only beautiful inside, but the food is incredible as well! Oh my goodness. It would be a dream to be able to dine in such a luxurious place like this. And I had to do a double take at the Afternoon Tea situation. The presentation is truly unique! I’m sure you and the kids enjoyed that 🙂 The desserts are so cute! The tea is so unique and modern, yet also playful and fun! The dishes were so good too. Mott 32 was definitely an experience and the decor and food was something I will always remember. It really seems like you had a great experience there. I love how luxurious and beautiful it is. So, off course i’d love to grab the afternoon tea. I truly did Catarine. Mott 32 is such a beautiful restaurant and the food was really like Hong Kong! The afternoon tea was also such a treat and the little bites were tasty and the presentation was perfect. What a gorgeous area! All the food looks delish! Thank you Jae. Both restaurants here are so gorgeous inside and yet so different. The food is amazing and really something you have to try for yourself! I just love hearing history behind the names of restaurants and I think it’s so cool that this one is named after a street in NYC! Though all those dishes look so delectable, I’m going to have to go with the Mixed Seafood Fried Rice as my favorite. I’m from Louisiana and that by default, makes me a big fan of seafood anything! Me too, I love hearing how someone came up with a name or stories on how they got to where they did. The dishes are amazing and so tasty. Haha, I love that you would go for that Seafood Fried Rice too. It was such a winner in my book! Beautiful restaurants and the food looks incredible. I will have to try Mott 32 in NYC in September when I am there. Thanks for sharing. Wow what an amazing experince Christine, and I love that they named the restaurant after the first Chinese convenience store in NYC! All the food looks delicious, that dumpling just looks sooo good!! And how cute are you with that cotton candy drink? I wanna jump on to a plane and go there to experience in person! Your hotel experiences are always goals, thanks for sharing with us!! Such a beautiful place. The food looks so good!! And you looked incredible gorgeous as always, babe. That ma for sharing! Happy Friday. What gorgeous places to chill or wine and dine in Vancouver! 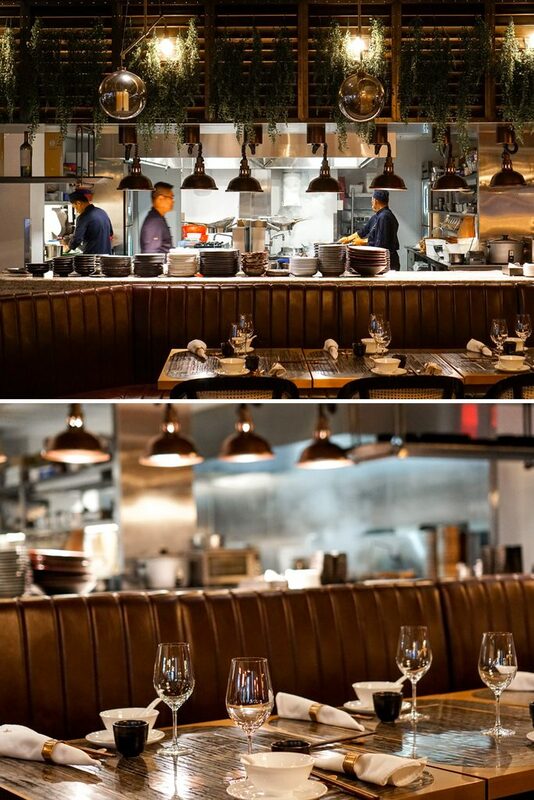 I love the look of Mott32! 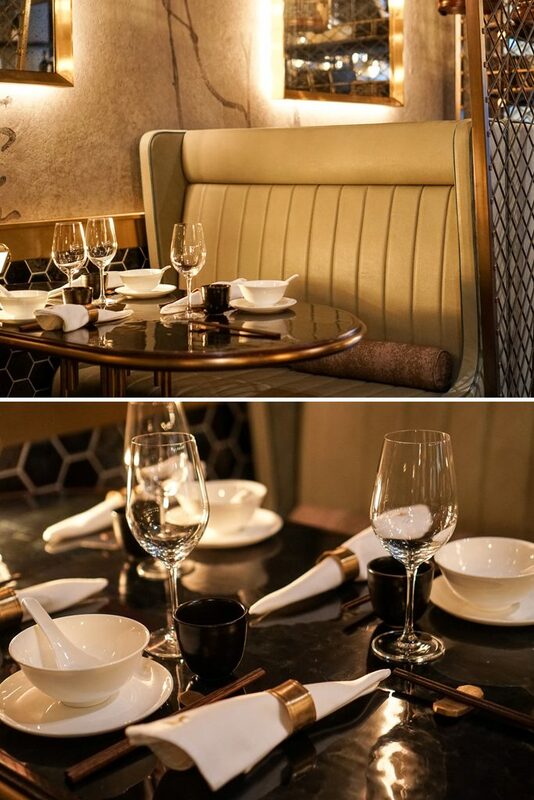 Never saw Mott Street that glamorous before 🙂 The opulent and Asian-inpspired decor looks absolutely gorgeous. What a wonderful post review. Very detailed and traditional cuisine. It’s an art. 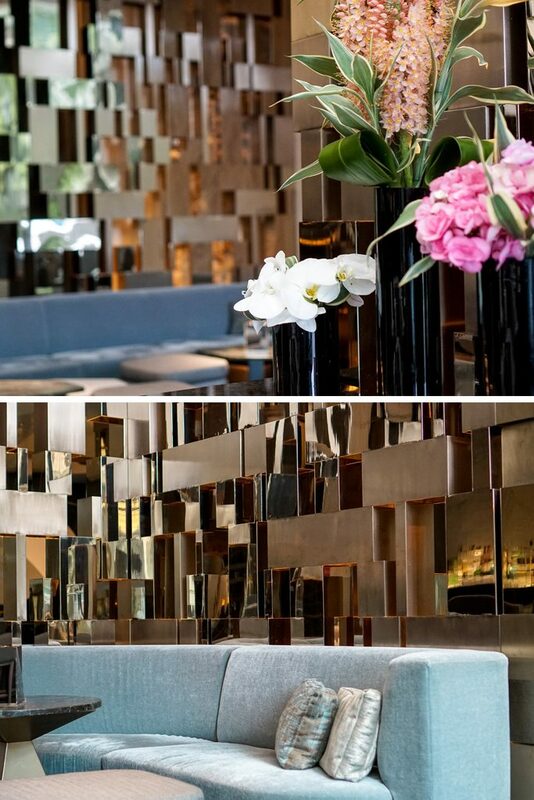 The Mott 32 are incredibly beautiful and luxuriously decorated. The dishes look like a real taste of the palate. I’m inspired by the TEA LOUNGE BAR. Mott 32 looks really neat! I love the vibes the whole place gives out. Makes me feel like I’m in vintage China. Their cocktail options sound delicious! I need to give them a try some day! Oh man, their food sounds delicious and super fancy with the black truffle! The quail egg in the siu mai sounds delish. TTCL looks like a fancy place. I am a huge sucker for marble! Their finger foods look tasty as well! Looks like a worthwhile experience. How pretty is that high tea spread, would go there anytime if I’m in the area, looks really good!!! So beautiful. The way they pay attention to detail is just perfect. The food looks so yummy. Lovely! As a frequent visitor to NYC I read your review of Mott 32 with immense pleasure and soaking in the atmosphere of the place I truly am looking into booking a stay here when I take my mom to NYC for some Christmas shopping. Such a gem in Chinatown! Thank you for the tip hun! Mott 32 looks like my idea of a great dinner! I love that the decor reflected the same attention to detail that they food definitely has. And that sao mai is making me drool! This place is stunning! It’s like walking (and dinning) back in time. Also, their food looks delish! Will put this one on my bucket list. Lovely photos by the way.